Here are some of our favorite local (Midwest) dive sites. We run classes primarily in Haigh Quarry, Pearl Lake and Chillicothe Rec Center, but you'll often find us all over the Midwest, so call the store and see where we'll be next. Looking for someplace exotic? Join us on one of our Trips coming up! Affectionately known as the Caribbean of the Midwest, Haigh Quarry boasts a very diverse set of dives, dives from 15' to 80'+, and even Giant Spoonbill fish. 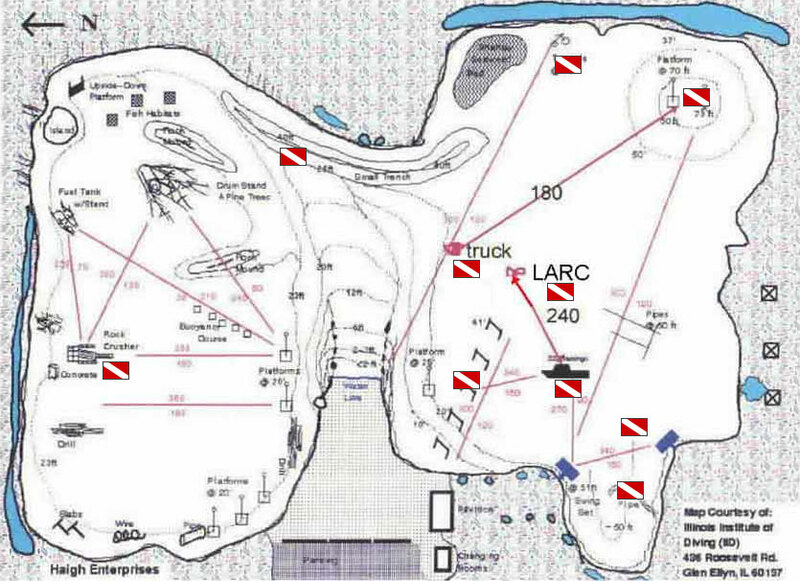 Located near Kankakee IL, MDS runs many classes at Haigh since there are so many different things for divers to see. Click here for a map of Haigh attractions! Located near the Illinois/Wisconsin border, Pearl Lake offers a nice change of pace for local divers with a very easy shore entry. As the Lake involves an overnight stay, the Pearl Lake Supper Club hosts many fun evenings with old and new MDS divers alike. The closest site to Bloomington/Normal, Chillicothe Recreation Area is an RV park that also has a lake for SCUBA. You can pull your car within inches of the water, making setup extremely easy. The shallow depths provide lots of bottom time to see the boats, bus and airplane underwater. And an MDS tradition is to visit each September/October to see the tiny freshwater jellyfish unique to Chillicothe. Click here for a map of Chillicothe attractions! Mermet Springs is in Southern Illinois near Metropolis, and is home to many unique attractions, such as a 727 airplane that can be swum through, a railroad car, a submarine, and others. France Park is in Logansport Indiana, roughly three hours from Bloomington/Normal. France Park is known for also hosting the Spoonbill, making it a great location for classes like Underwater Naturalist or Fish Identification. The Great Lakes are nearby and Milwaukee and Chicago are full of wrecks from the past 150 years, so each year MDS hosts trips to see them. Call the shop to see a part of the Midwest everyone knows about and no one has been to - UNDER the Great Lakes!